In 1850 Nathaniel Hawthorne published The Scarlet Letter--a dark, brooding novel of hidden sin and expiation. Fearing that the novel was too dark, he prefaced it with a short, lighter introduction: "The Custom House" sketch. Hawthorne had actually worked in the Custom House as Surveyor, from 1846-1849. In his introductory sketch, he leads the reader up to the building and through the first story offices, in a literary virtual tour. Finally, he brings the reader to the musty and cobwebbed second floor where, he solemnly assures us, he discovered the historical records that became the novel, The Scarlet Letter. Hawthorne's description of the Custom House emphasizes the nearby dilapidated wharves and decayed wooden warehouses crumbling to ruin and his office "cobwebbed and dingy with old paint." Hawthorne offers us an almost gothic Custom House, a fitting element in the introduction to a romance novel. The Custom House is, in fact, an airy, handsome structure, flooded with light. This is characteristic of Federal period buildings. Hawthorne does recognize these qualities when he describes the building as "a spacious edifice of brick" and mentions the lofty height of the ceiling in his office. Perley Putnam, a Weigher and Gauger for the U.S. 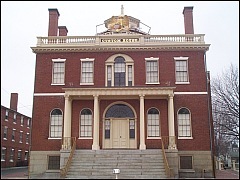 Custom Service, designed the Custom House in 1818 and oversaw its construction the following year. His superior, Treasury Service Agent William R. Lee, designated Putnam along with Jonathan P. Saunders, Surveyor of the Port, to draw up plans for the proposed building. Putnam and Saunders actually submitted two plans, one for a Federal style structure and the other for a Greek Revival building. A scaled down version of the Federal plan was authorized by the Treasury department, which specified that construction costs should not exceed the appropriation of $10,000.00. The building was erected on a lot purchased from the Crowninshield estate on Derby Street directly across from Derby Wharf.